Once you have downloaded and installed the iLok License Manager software you will need to sign into your iLok account in the cloud. Haven't Got iLok License Manager Software? You will need to install the free iLok License Manager on each computer, and you can download it from the iLok website. The iLok License Manager requires one of the following operating systems: For Mac: Mac OS X 10.7 (Lion) or above For Windows 32-bit or 64-bit: Windows 7 or above. Haven't Got A Free iLok Account? Enter your User ID and Password and you will be able to manage from iLok licenses and iLoks using the iLok License Manager software. Your Account View - Click on the User icon at the top left of your screen then choose All Licenses, Available, All Activations, or Unavailable. The Account View shows you your licenses and the grid is customizable. You can right-click on the table header to choose which columns are shown. You can dynamically sort the list of licenses by clicking on a column header and even drag the columns to rearrange them. All Licenses - Shows all of the licenses in your account, both activated and not activated. Hidden - Shows licenses that you have chose to hide from the other views. Only licenses that are not activated on any location are eligible to be hidden. Your registered iLoks will appear in the Locations list on the left of your screen. The list includes offline iLoks registered to your account and all currently plugged in iLoks. Black icons indicate a plugged in location, grey icons indicate offline. You can still see what is on the offline iLoks, making it easier for you to manage your license inventory. Each license has a detail pane which gives you important information about the license and the software publisher. If the detail pane is hidden, click the "Show Details" button. You may also start Activate, Deactivate and License Transfer operations from the detail pane. Locked groups stay together, unlocked groups can be split across several locations. Locked Groups. Some of your licenses may be grouped together. Software publishers can deposit licenses in two types of groups: locked and unlocked. Locked groups (previously called Bundles) always stay together and must move as a single unit. Licenses in unlocked groups can be split up - some group members can be on an iLok while others from the same unlocked group are still in your account or on a different iLok. When you drag a member from a group, you will see just one license move if it is from an unlocked group, or all members of the group move if it is a license from a locked group. How do I move licenses from my iLok account onto one of my iLoks? This is the fastest and most common way to activate a license. 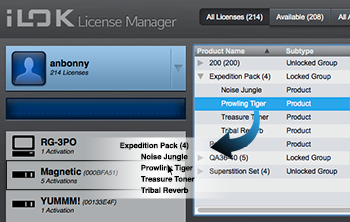 Select the license you want to activate in your iLok account in the cloud. Confirm the move in the popup window. To use the buttons, you will need to select the license you want to activate from the list of licenses on one of your iLoks. Click the Activate button in the upper right-hand corner and select a location in the pop-up window, this will be one of your iLoks. When activating a license to an iLok, the iLok must be plugged into your computer for the operation to be successful. How do I move licenses from my iLok and put them back into my iLok account? This is essence is the reverse of the above, again the drag and drop method is the easiest. Click the Activate button in the upper right-hand corner and select a location in the pop-up window, this will be your iLok account in the cloud. How do I move licenses between my iLoks? You can transfer licences between different iLoks. This service is free for any iLoks you own within one account on iLok.com and was the most requested feature from user groups when they were developing the iLok License Manager. A lot of people have two or more iLoks that they’ve collected over the years. Now you can combine those multiple licences onto one iLok, or organise your plug-ins on different iLoks. For example, I have two iLoks, one for my studio machine and one for my laptop when I am on the road. To transfer licences between your own iLoks, first, make sure your iLoks are plugged into USB ports on your computer and then run the iLok License Manager application. You can move licenses in one of two ways: You can drag and drop or you can use the "move license" button. Select the iLok that contains the license you want to move, the source iLok, in the left-hand column. Select the license on that iLok you wish to move from the table to the right. Click and drag the license you wish to move to the new iLok, the destination iLok. Be aware that the source and destination iLoks need to be registered to the same account and both plugged into the same computer for this to work. If necessary, click "Show Details" at the bottom of the iLok License Manager window. Select the destination iLok from the locations list, and click "Activate". Transferring licences between different accounts (also known as transfer of ownership) is a very similar process to transferring within your own account and is great if you want to buy and sell any plug-ins from other users. It is handled securely by iLok.com, but be aware that this type of transfer is not free. Buying and selling iLok protected software is not without its pitfalls. We recommend you check 3 articles on this before you start buying and selling iLok protected software. There are three ways to transfer a license. There is a $25 fee per license or bundle (locked group) for transferring licenses to another iLok.com account, but each License Transfer order has a maximum charge of $50, so you could transfer two licenses or 10 or 100 and the price would be the same - $50. When transferring a license, you will be asked to confirm your account information by signing in again. This protects you if you leave your account signed in where others can access your computer. Software publishers decide if they will allow transfers of their licenses. Some software publishers allow transfers, but will want to approve the transaction. You can look at the license detail to see if a license can be transferred. Find the license you wish to transfer and select it by clicking on it. Next, click on the Transfer icon in the top right corner of the iLok License Manager window to start the process. Find the license you wish to transfer and select it by clicking on it, then click on "show details". You can then click on "Transfer" to start the process. Right-click the license you wish to transfer and select "Transfer" to start the process. Then follow the instructions carefully. When transferring a license, you will be asked to confirm your account information. Be careful when entering the destination User ID as transfers cannot be reversed or undone. Some software publishers (vendors) allow for iLok-to-iLok transfer within an account, and some don’t; however, iLok.com will tell you if they don’t. Also, some companies don’t allow any transfer of licences at all. This is based upon each software publisher’s business policies. So it is worth checking with a software publisher before you try to buy or sell a plug-in, in case they do not allow transfers and you end up buying a plug-in you can’t transfer onto your own iLok! It is up to the individual software publishers to determine what transfers they will permit under the terms of their licence to you as the end user, but of course, you all read and are fully conversant with the terms and conditions of each software licence… after all, nobody would consider just clicking OK to the ‘Have you read the term and conditions’ tick box without studying them in detail, would they? Another factor to be aware of is that although iLok will email the software publisher to inform them of the licence transfer, the software publisher won’t necessarily provide support for transferred plug-ins: as before, it is the choice of the software publisher and not iLok.